SolarCity (SCTY), a top U.S. solar installer whose chairman is Tesla Motors' (TSLA) Elon Musk, said Friday it sees room to install 71% to 89% more megawatts next year than the 278 MW it expects this year. Shares surged 23% to 47.18. They are up 490% since the December 2012 IPO. It's "an aggressive target," but achievable, said R.W. Baird analyst Ben Kallo. However, he sees risks amid rising competition. Raymond James analyst Pavel Molchanov says the installations growth forecast, 80% at its midpoint, tops the 60% his firm has been expecting. He notes that it would follow a similar gain this year. It also suggests SolarCity has increased beyond the 20% market share it held then. "The market is also robustly expanding as well," said Molchanov, also cautioning about competition. SolarCity serves the U.S. distributed solar market, which concentrates on small systems, typically rooftop panels. About 2.7 gigawatts of this installation is expected nationwide in 2013, growing at a compound annual 20% over the next five years to 8 gigawatts in 2018, said Lux Research analyst Matt Feinstein. The falling price of solar power system parts, the many rooftops on to which solar could still be installed and the availability of third-party financing all go into analysts' growth expectations. SolarCity is hardly the only one plowing ahead in distributed solar, especially for the residential market. Kallo says private Vivint Solar (in a fund managed by Blackstone Group (BX) is No. 2 in the U.S. in leasing. 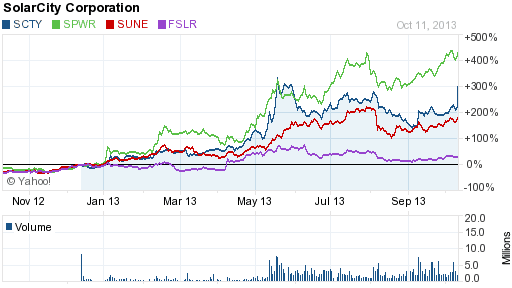 Big publicly traded solar manufacturers SunPower (SPWR) and SunEdison (SUNE) have gotten into distributed solar too. So have private SunRun, Sungevity, Clean Power Finance and others. SunPower shares rose 4% to a new closing high. SolarCity will compete with more new players and with existing ones for a "limited pool of tax equity funds," said Kallo. With this kind of financing, an area SolarCity pioneered, banks or other investors, say Google (GOOG), provide up-front cash and make use of a federal 30% solar investment tax credit. But that credit will shrink in just a few years. San Mateo, Calif.-based SolarCity, which operates in 14 states, has more than 82,000 residential and other customers, typically on leases or using power purchase agreements. In a 20-year lease, the customer typically puts nothing down, while payments are designed to fall 10% to 15% short of what the retail electric rates would have been, generating a net savings. "One of the biggest differentiators with SolarCity vs. any of the competitors we've seen in the marketplace today is that we do it all ourselves," CEO Lyndon Rive told IBD. "Many use creative financing but leverage local installers, but it's hard to maintain customer satisfaction and quality. "If you are doing it yourself you have to make sure the system is producing electricity for the next 30 years," he said. "You have to maintain the system — it is your problem so you are aligned with the customer. Rive said rivals with more middlemen ultimately are apt to struggle producing a profit margin high enough to survive without current solar incentives. The U.S. distributed solar market is likely to "really pick up in 2016 ahead of the investment tax credit reduction to 10% from 30%," Feinstein said. He says "everyone" with a solar project big or small is apt to "try to get everything in" before the incentive cut. But after it, the distributed market will still have useful financing methods. SolarCity is losing money, and is expected to continue to spill red ink through 2015, though at a declining pace. But it's the No. 2 company by market cap in IBD's Energy-Solar group, after manufacturer First Solar (FSLR). The industry is ranked No. 35 of 197. "SunPower provides panels to dealers who do installations. SolarCity is going to build the whole supply chain themselves, so I think the scale-up is a little more difficult in that regard," Kallo said. "I think there's operational risk as they have to hire hundreds of new people, scale up warehouses and roll out trucks in a timely manner. What happens after the investment tax credit sunsets Dec. 31, 2016, is "a long-term issue for the industry," Molchanov said. "In the near term, net metering is also a risk factor. Net metering is the agreement through which renewable energy customers can use the grid but also feed power back to it. Solar power has a "tiny, tiny" market share in the U.S. but utilities still regard it as a threat, Molchanov said. Utility companies have filed proposals with several state regulators "to tighten the rules of how residential solar customers are allowed to connect to the grid," he said. "Some ideas have been to cap residential solar or impose a fee residential solar users would have to pay to connect to the grid. A California Public Utilities Commission study found that net metering will, by 2020, shift $359 million in annual costs from customers with solar panels to other ratepayers in the state. That study is disputed by others. California Gov. Jerry Brown on Oct. 7 signed into law a broader utility rate overhaul that will let customers with rooftop solar continue to sell power back to utilities. The utilities will be able to recoup some costs with a fixed monthly charge of up to $10 for certain residential customers.